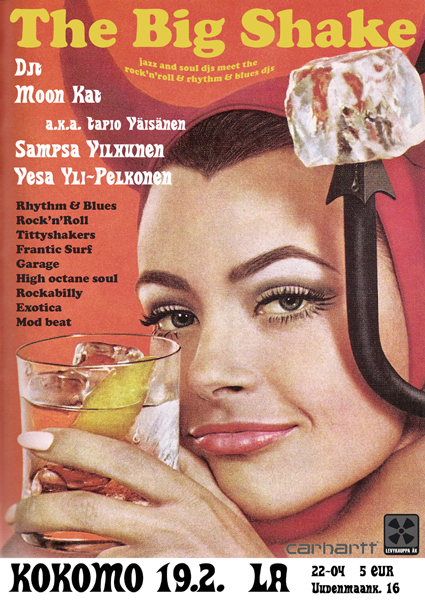 Under the buzzword The Big Shake upcoming Saturday the DJs Moon Kat aka Tapio Väisänen, Sampsa Vilhunen, and Vesa Yli-Pelkonen from the Wahoo! collective do a night in the name of party music from the past. Instead of playing modern House, Techno, Hip Hop, or Dubstep rhythms they invite all fearless dancers to a bash where old Rhythm & Blues, Rockabilly, Surf, Exotica, or Garage Rock call the tune. So all those who have an old pair of Beatle boots in their cupboard or like to dance the Jitterbug or Sock Hop: come by and go bananas!